“Bar-jesus”—or the son of a man whose name is Jesus, or Joshua. 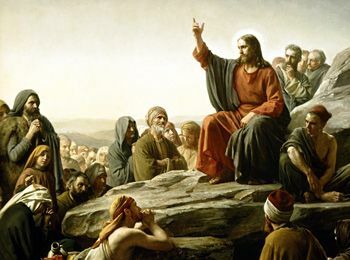 In fact, he had two names, one, Bar-jesus, was his Jewish name and a patronymicii, and the other “Elymas,” was an assumed name or title meaning “wise,” (v. 8) (an Aramaic word, probably connected with the Arabic Ulema, or sage), a title describing his claims to have received wisdom and supernatural powers from God. The word "Bar" is Syriac, and means "son." Jesus (Joshua) was not an uncommon name among the Jews. The name was passed on from his father, so he was the son of Jesus, or Joshua; as Bar-Jonas was the son of Jonas. The island of Cyprus was at this time in the hands of the Romans. Under Augustus the Roman provinces were divided into two classes, one class of which needed the presence of troops for their government, and since the Emperor was in control of the army, the province was under his jurisdiction, and was called imperatorialiii, while the others were called senatorial provinces. The former was governed by an officer named a proprætor (or, deputy), the latter by a proconsul. The Roman governor of the island, very likely dwelt at Paphos, since it was the principal city on the island. This is an instance of Luke's great accuracy. Cyprus had become a senatorial province during the reign of Claudius, but previously it had been one of the emperor's provinces governed by a propraetor, or legatus. Paulus was a common name among the Romans, but we know nothing about Serguis Paulus. The word rendered here as “prudent” means intelligent, wise, and learned. It also may have the sense of candid, and may have been given to this man because he held large and liberal views of a philosophic and inquiring mind; and was willing to obtain knowledge from any source. Hence, he had a lot to do with the Jews; and was also willing to listen to Barnabas and Saul. It is not often that men of high rank are willing to listen to the advice and teaching of the professed ministers of God. This adjective describes what we call general intelligence and discernment, as in Matthew 11:25; Luke 10:21; 1Corinthians 1:19. In this instance, it shows that he immediately recognized the higher type of character possessed by the Apostles, and that he desired to know more of the “word” which they preached. The presence of Elymas among his staff, and his desire to hear Barnabas and Saul indicates that the proconsul was a man with an enquiring mind. He was “a prudent man,” in the management of his affairs, as a governor; and might be very learned, ingenious, and an understanding man; a man of great wisdom and perception, who very likely saw through the vain pretensions, and deception of Bar-jesus, and desired to expose him publicly; or at least he would be exposed by those good apostles, who had come to his city. Sergius Paulus, a man of knowledge, superior intelligence, and understanding, who thirsted for truth, sent for Barnabas and Saul, “earnestly desiring” to hear the Word of God. He sent messengers to them, to request that they come to him; Barnabas is mentioned first, though he was the inferior person, because he was a native of that country and might be best known. It is probable that they had preached in Paphos, and Sergius desired to hear directly from them the essence of their new doctrine.